Today is a special day...our little Ernie is no longer a baby but a big bad 2 year old. If you think about dogs in human years, Ernie is now in the years of 14-21...so no longer a toddler/teeny bopper (let's see if he grows out of his stubborn-ness hehe). 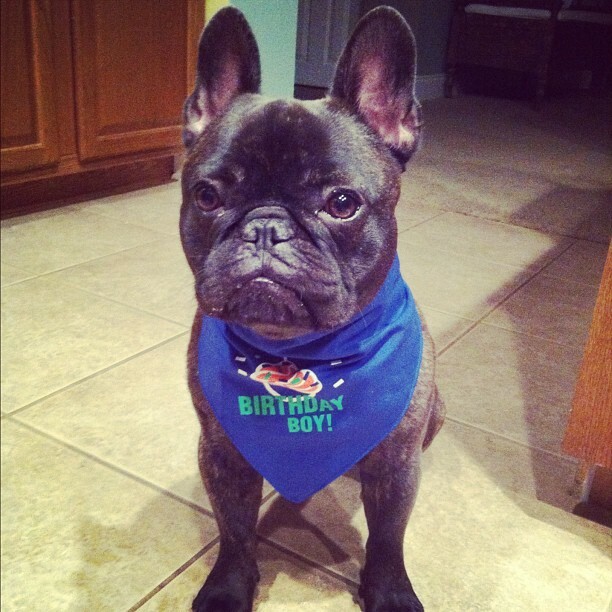 Ernie wasn't a fan of his birthday bandana from his Mimi but will definitely enjoy a nice piece of cheese this evening. Happy birthday chunky! I was planning on posting a giveaway today but after an awesome weekend of football (and remembering that today was Ernie's birthday haha), I am going to postpone that to next week. I know I may have confused you all if you follow me on Twitter or Instagram but I did not go to Baylor. I went to A&M but am actually a huge Baylor fan because Jon went there. 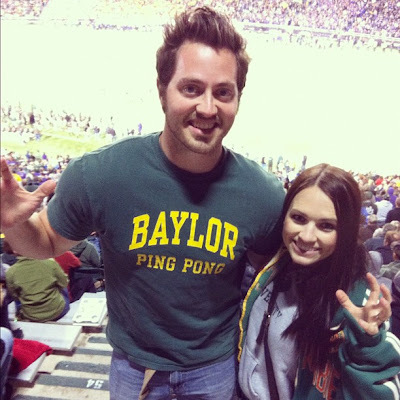 We went to the Baylor/K State game on Saturday and expected a blowout but man we were wrong!! Y'all, it was the most fun game I've ever been to!!!!!!!!! Not only did Baylor beat the #1 team in the US (and make history), they kicked their booties! It was absolutely freezing and such a blast. I'm not really a huge football fan on my own (meaning I wouldn't watch without Jon) but to see Jon be so happy and go crazy wild...priceless!! 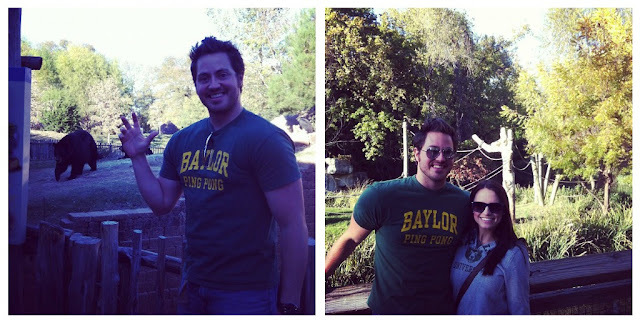 Before the game, we went to the Cameron Park Zoo in Waco which is surprisingly REALLY good. We try to go to a zoo or aquarium in every city we visit and back in August, I had an experience at the Salt Lake City Zoo that I didn't think I could top. But I did. The male lion came right up to the glass and started roaring literally inches from my face...it was amazing y'all. Literally once in a lifetime and will never happen again. If you are ever passing through Waco, go to the zoo...it's cheap and wonderful. We drove straight to Dallas that night and fell into bed at my sister's after 1am. 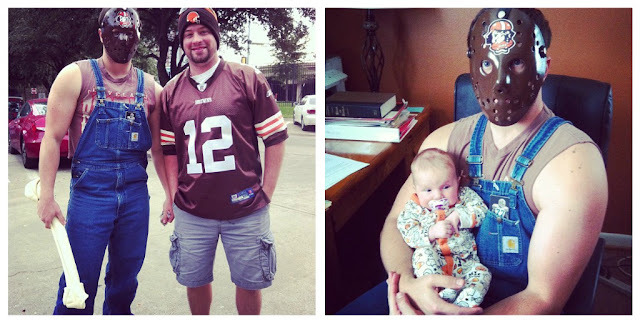 Jon stayed in Dallas to go to the Browns/Cowboys game while my sister, Embry and I headed back to Austin. I posted these pictures on Instagram and the comments were hilarious. Lot's of people (including Jon), thought the one on the right could be on Awkward Family Photos.com. Embry wasn't so sure about Jon's mask. And if you're wondering, Jon was born and grew up in Cleveland until he moved to Texas to go to Baylor in 2001. Ernie got to meet Embry for the first time yesterday at my parent's house. I was a little nervous for the first meeting because he has never really been around babies but he was funny. I would be holding her or she was laying on the floor and he'd come over, sniff and lick her, then walk away...looking for a ball. He moves too fast so I couldn't get a good picture but this is what I got. He looks so weird, almost mean because his eyes are partially closed. I think Ernie will love it when Embry starts walking because he loves little ones that are almost his size! 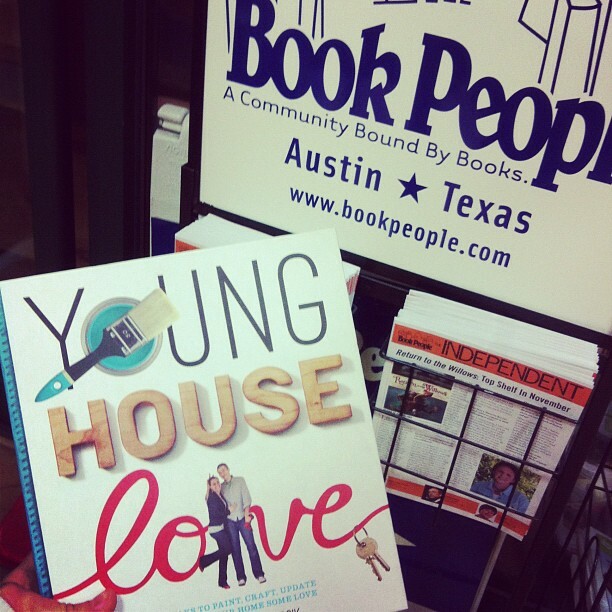 50 days until I meet John and Sherry from YHL! My sister met them this weekend in Dallas and I was giddy for her. Theirs was the first blog I ever read and is still my favorite! Our mini Thanksgiving (thanks to Jon!). This was our 4th time to celebrate on our own, more on that Wednesday! I woke up EXCITED today which is odd for a Monday haha. Tonight my mom is hosting a "Sip and See" for her friends to meet Embry and we have family coming in very soon! Short weeks make me so happy! Am I the only one who doesn't mind it's Monday morning?? 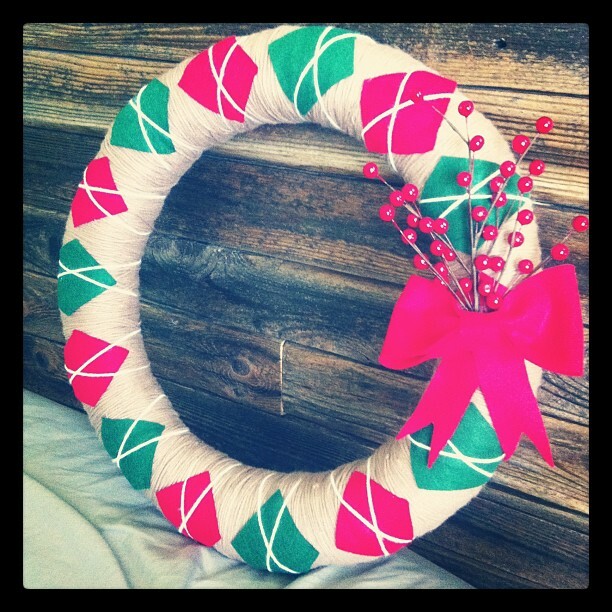 I love your wreath, so cute! I'm sooooo jealous you get to go meet John & Sherry :( I'm going to register for when I have my bridal shower! Sounds like y'all had a great weekend. Baylor did such an awesome job in that game, I was so excited they beat Kansas! So awesome!! Aww happy birthday pup!!!! Sounds like a fun time rooting for Baylor, I have a cousin who goes there right now, glad to hear they played well! :) Happy Monday! That Baylor win made me so Happy! Send a big congrats to your hubby for me! 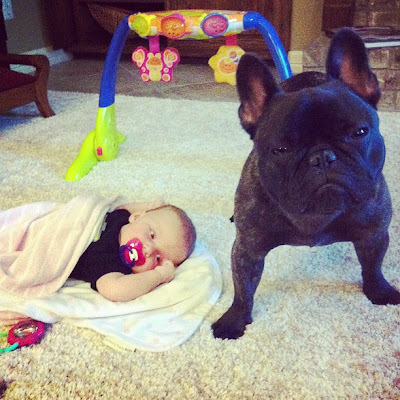 Frenchie + Baby= eternal cuteness. Have a great week! Last night we were playing ping pong, and Scott brought up Jon and his love for ping pong and how it's so funny. You would never expect it! Oh and No, I'm actually so happy that it's Monday because I only have 2.5 days of work this week!!! Happy Birthday Ernie boy!! & sounds like such a fun weekend!!!! 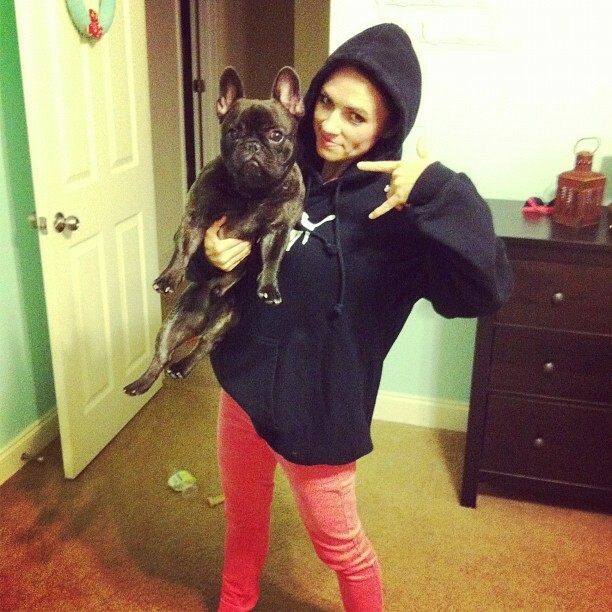 Awww happy birthday Ernie!! he is such a cutie! This Monday could not be any better since we are leaving Wednesday for La so we'll have less than a half week! Oh and I LOVE that wreath! I saw it on pinterest (probably when you had pinned it) and I bet this cost you no more than 5 dollars even tho online it is like 50 bucks for the wreath! 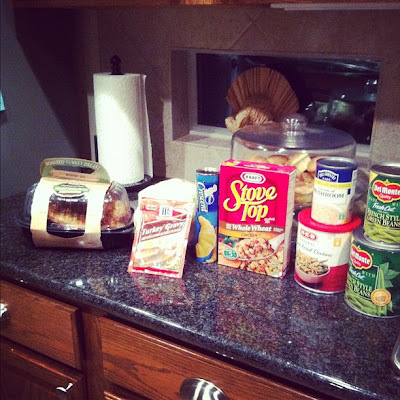 I need to get crafty like u!! I heart everything about this but the mask. I am a scardy cat! I would have ran to hide.